This one-of-a-kind package commemorates the 100th anniversary of the legendary Battleship that bears the name of our great State. Once considered the most powerful weapon in the world, the Battleship Texas is the last surviving dreadnought to have served in both major World Wars. Each item in the package has been meticulously hand-selected, including actual relics made from the ship. This is not just a unique collection but also an opportunity to own a piece of Texas history. 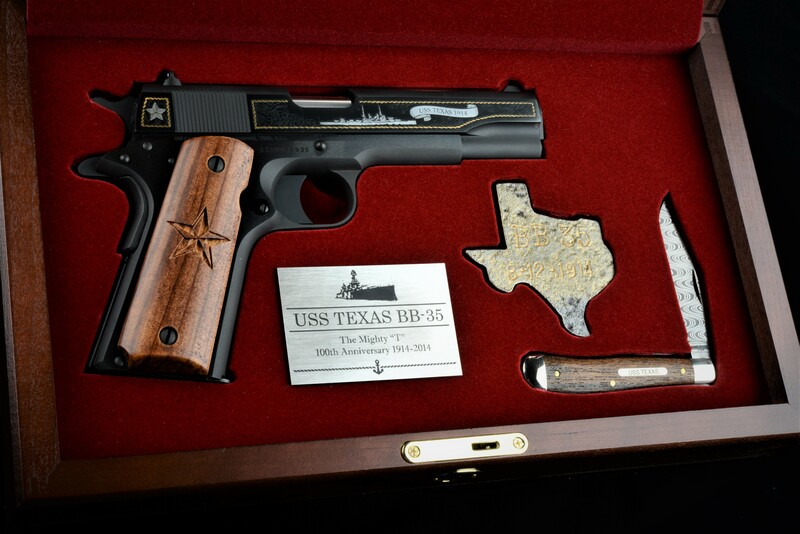 In celebration of the 100th anniversary of the commissioning of the Battleship Texas in 1914, the Battleship Texas Foundation partnered with Colt Manufacturing Company to produce a commemorative model of the original .45 caliber sidearm issued to the USS Texas in 1911. 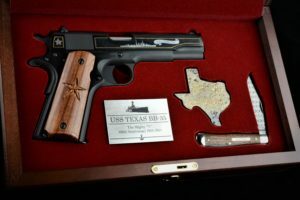 This limited-edition pistol was donated by Mark Cash of Texas Patriot Arms in conjunction with Bruce Bramlett of the Battleship Texas Foundation, and is one of only 2000 pistols made. Guests of the Houston Gala will be able to bid on this item during our Live Auction. Custom 1911 grips made by 1911 Grips Store from reclaimed deck planks from the Battleship Texas. These grips were hand-selected for this particular pistol only and are the perfect complement to this firearm. Custom handmade Damascus steel pocketknife made by America’s Fighting Ship Knives. Features an engraved nameplate bearing its name, beautiful herringbone Damascus pattern blade made of steel from the ship and richly appointed with a handle also crafted from rare teak deckwood from the Battleship Texas. Custom handmade cherry wood shadow box made by GunboxesUSA.com, a division of On Display USA. The case is hand-rubbed to a beautiful luster and fitted with fine solid brass hardware. The interior is French-fitted with Rich-vel, and the glass lid is engraved with the Battleship Texas logo. On Display is a premier custom case builder and has established a reputation for unparalleled quality, making cases for Super Bowl Championship Rings, the Carnegie Hero Fund, and recipients of the Congressional Medal of Honor, to name just a few.